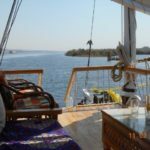 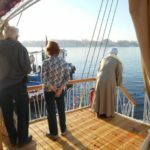 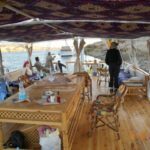 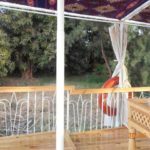 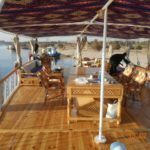 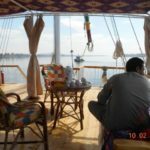 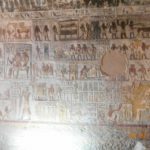 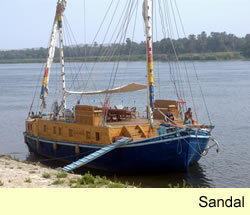 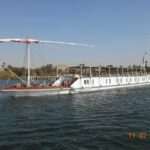 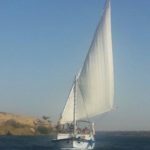 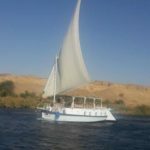 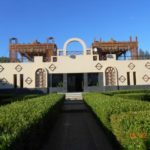 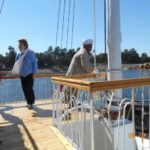 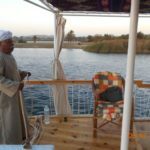 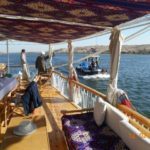 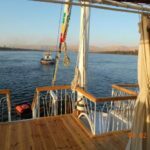 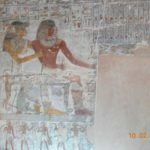 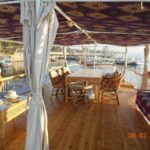 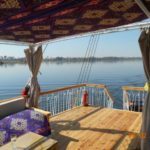 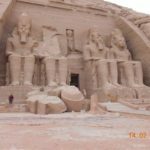 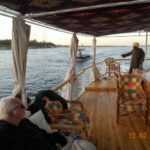 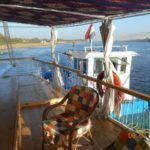 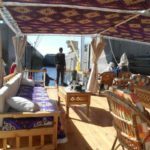 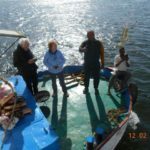 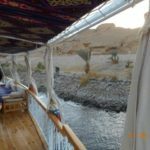 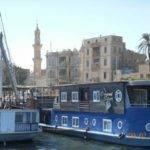 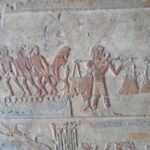 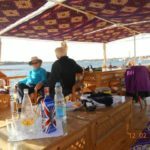 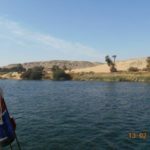 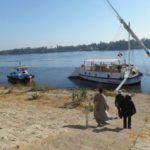 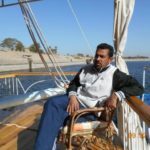 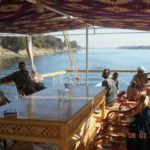 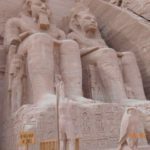 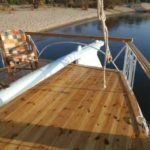 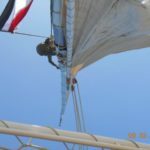 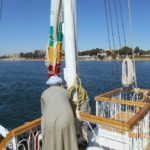 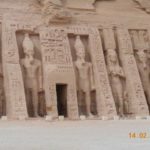 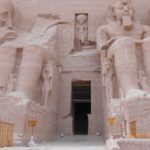 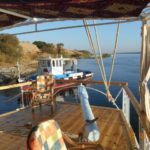 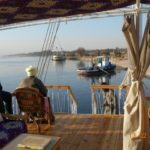 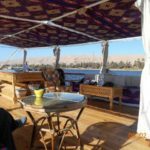 This is a brief description of my holiday from Luxor to Aswan under sail, and then on to Abu Simbel by land. 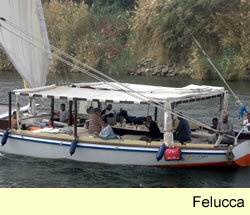 Then return to Luxor. 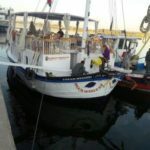 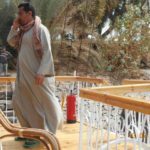 Mahmoud found a new Sandal (a smaller version of a dahabiyya), engaged an experienced reis, (skipper) two deckhands, a cook, a steward, a tow boat with two crew for when the wind failed, and agreed to come with us. 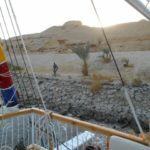 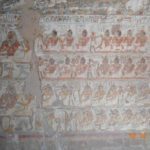 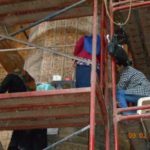 We went for 8 days, but we agreed that we did not want to bypass any of the archaeological sites en route. 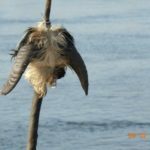 And I hoped that there would be some interesting bird life. 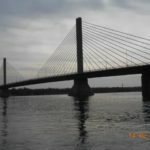 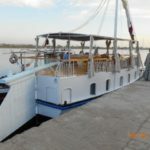 It was expensive but that was inevitable with only three of us on board, and it could certainly be done much more economically, if the boat was at capacity – eight people. 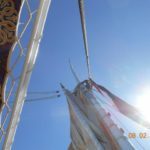 0745 – early start. 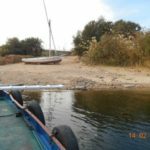 Driven down to the river, and boarded the Sandal. 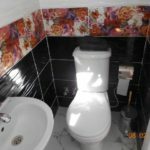 First impressions very favourable. 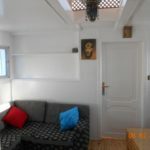 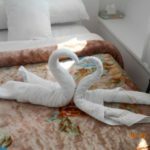 Comfortable en-suite cabins, helpful crew, greeted by the Captain with “Lovely morning” which proved to be the only English he knew but he certainly knew his sailing. 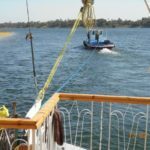 There was a large and powerful tug alongside, and with the wind ahead, we were towed up river and under the Luxor Bridge. 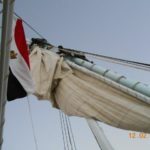 Here, the river turns and it was now possible to hoist the large lateen sail, which required two crew to climb up the mast. 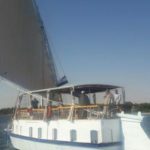 This is “Dreamweavers” maiden voyage and she moved beautifully through the water. 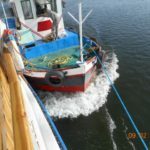 The tug now dropped back out of sight and out of hearing. 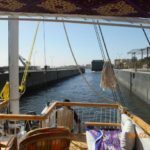 As darkness fell, we were within sight of the Esna locks, but retraced our course to tie up alongside the bank, where we spent a peaceful night. 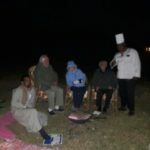 A beautiful moonlit night. 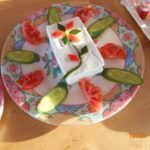 Excellent dinner, and an early night. 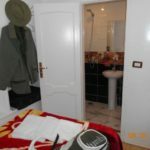 Woken at 0615, hot shower, and breakfast. 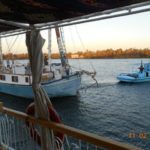 The tug was brought alongside for propulsion through the locks, as there would otherwise be no means of stopping the Sandal from running into the lock gates. 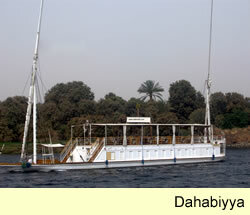 After which, we resumed the voyage. 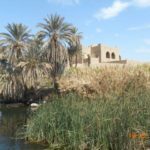 Visited Esna temple – mainly Roman with parts of the Ptolemaic structure still visible. 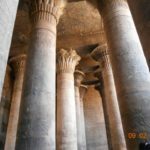 The hypostyle hall is situated in a deep chasm, with the rest of the temple still buried beneath the new town. 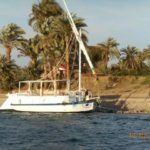 Back under sail by 11.30, and brought to mooring at El Kab by 18.30. 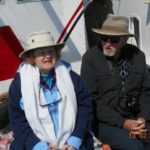 Lots of interesting birds seen, including a pair of Golden Orioles. 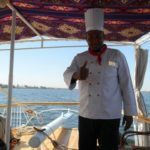 The chef, who appears in full regalia, again produced a really excellent dinner. 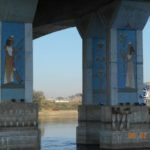 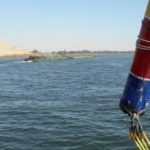 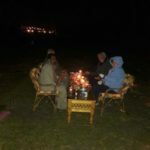 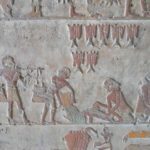 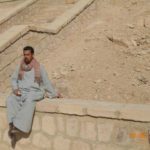 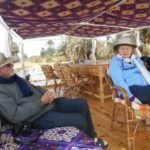 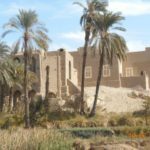 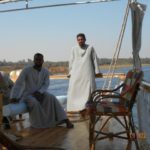 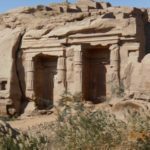 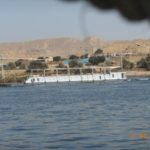 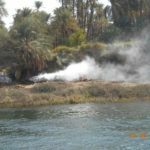 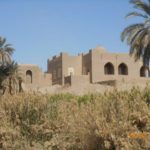 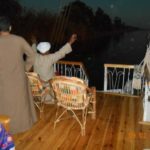 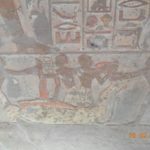 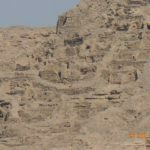 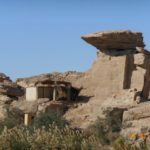 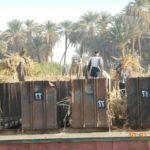 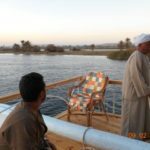 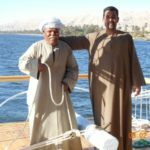 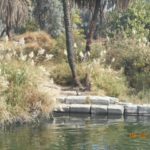 Day 3 Friday 10th February Visited El Kab and sailed to Edfu then to Gebel Silsila. 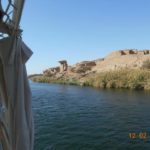 The walk from the riverside village past the ramparts of the old town to the tombs situated in the cliffs was delightful. 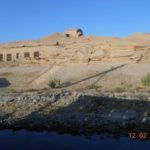 Not a place many visitors see, as they arrive by car. 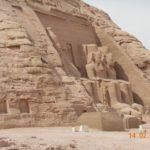 The tombs were interesting, and we were left to browse around at will, thanks to Mahmoud’s influence with the guardians. 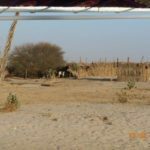 On the way back to the boat, we were waylaid by the village children, offering table mats and other things they had made. 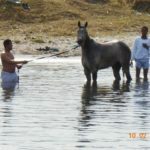 Mahmoud bought them off by giving all of them 5EGP each. 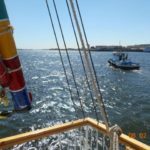 Little wind, so we proceeded under tow. 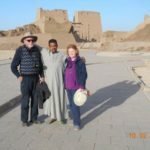 Arriving at Edfu, we piled into a caleche and got to the temple just as they were thinking of locking up. 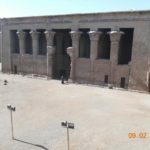 No other visitors so we had the whole of this magnificent edifice to ourselves. 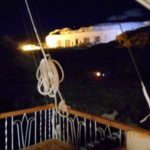 After visiting the temple, there was still sufficient light to proceed, and the wind had picked up. 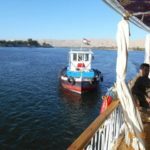 And it was noisy against the quay, so we continued to a quiet riverside mooring, four or five miles upriver. 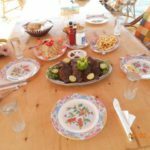 The crew leapt ashore with spikes which were hammered into the ground for the mooring lines, the barbecue was carried ashore and lit, and in no time, dinner was ready. 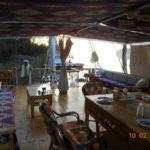 After dinner, the chef, a man of many parts sang a no doubt scurrilous ballad about the skipper, the crew, and the guests who made them laugh. 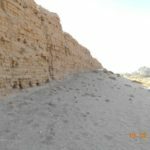 Perhaps fortunately, we could not understand it. 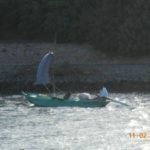 06.15 Lights on, hot shower, breakfast, and under weigh at 0900 with an excellent wind. 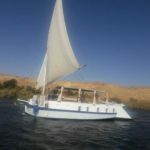 Made fast progress up river, and came to anchor at Gebel Silsila immediately under the Speos of Horemheb, exactly the spot where I berthed 10 years ago. 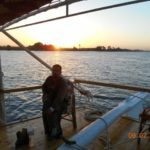 Time flies, but it hadn’t changed much. 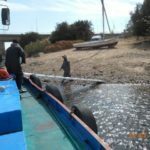 The skipper brought this heavy and large engineless boat into the bank very well. 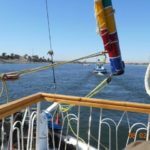 I don’t think I would have tried it with such a strong following breeze, and no room to stop before colliding with a moored dahabiyya. 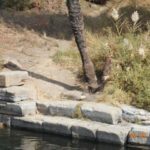 But he knows what he is doing. 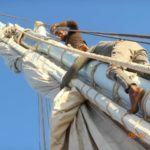 Earlier, he had his crew (and the chef) squatting round him on what passes for a quarterdeck, demonstrating the mysteries of back splicing rope. 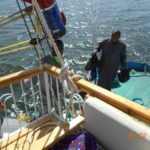 We were chased back on board by an overzealous guard, who didn’t want us ashore until we had bought a ticket. 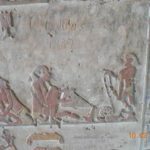 After breakfast went ashore and photographed the stele and inscriptions in the quarry. 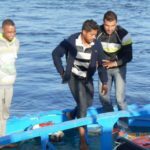 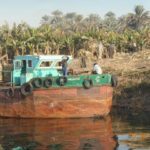 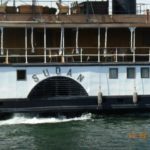 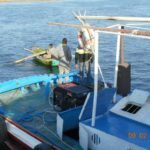 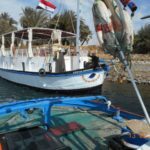 Mahmoud was keen to get away, as we had a very good wind, but as the tug manoeuvred to pull our stern clear of the bank, he hit a rock with his propeller, which stopped his engine. 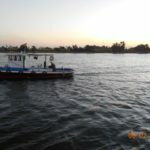 A few anxious moments but the engine restarted, and we were away, with the tug dropping out of sight again. 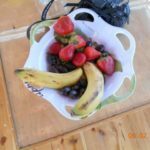 As always when we had been ashore, we were met with iced fresh fruit drinks. 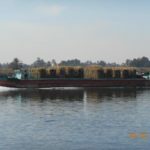 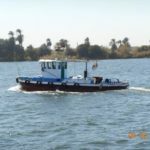 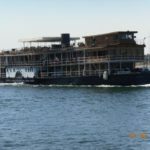 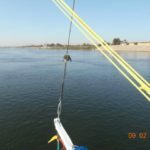 The tug was recalled for a photo opportunity and Sylvia and Bob went aboard with their cameras, and as the river wound round to the east approaching Kom Ombo, the sail was furled, and we finished under tow. 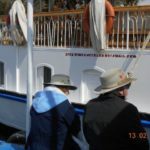 No cruise ships and hardly a tourist to be seen, but two cruise ships arrived as we were leaving. 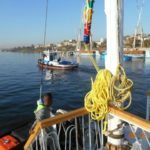 We left the chef behind to buy fresh provisions and the tug to bring him back, but we were sailing so well that the tug struggled to catch up with us, but finally did so after a long pursuit. 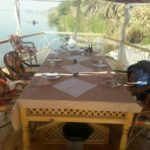 Dinner was again excellent – far better that any of the restaurants on the West Bank. 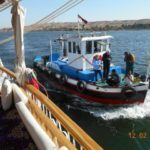 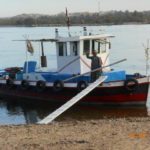 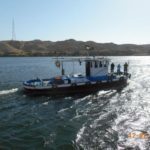 08.30 Farewell to the boat and her crew and across the river again on the tug to meet a minibus for the long drive to Abu Simbel. 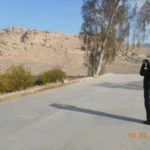 A featureless drive through the desert, livened by a remarkable mirage, with a lake, and black rocky pyramid like hills. 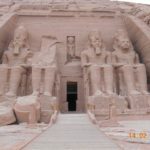 After booking into the hotel (good Wi-Fi) went to see the temple. 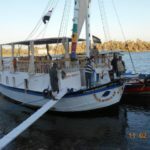 Very impressive, and very few tourists Having walked round it, Mahmoud took us to lunch in a small cafe, where I had the best fish I have eaten in Egypt, no doubt fresh from Lake Nasser. 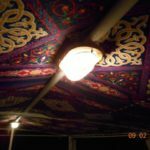 Bob and Sylvia went to the Son et Lumière in the evening. 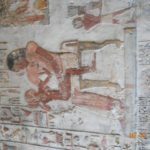 I went to bed so cannot comment on it, but they were both impressed, and thought it much better than Karnak.